Enter your design for a chance to be published in Just CrossStitch and win a fabulous prize package! If you've ever dreamed of seeing your original design published in the pages of Just CrossStitch magazine, now is your chance! Enter our Christmas Ornament Design Contest today! Note: Winning designs must be sent to Just CrossStitch to be photographed for publishing. SIX LUCKY READERS WILL WIN! 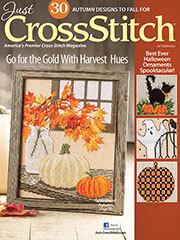 Have your design published in America's premier cross-stitch magazine! Win an amazing prize package that is filled with stitching supplies from our industry partners and valued at $730! No purchase necessary. A purchase will not improve your chances of winning. Contest open to U.S. and Canadian residents (except Quebec) age 18 and older. See offical rules below. Void where prohibited. Ready to submit your design? Head over to our contest page and fill out the entry form!